Oaxaca draws me back, time after time. Since 2005 I have visited this city of half a million inhabitants many times. 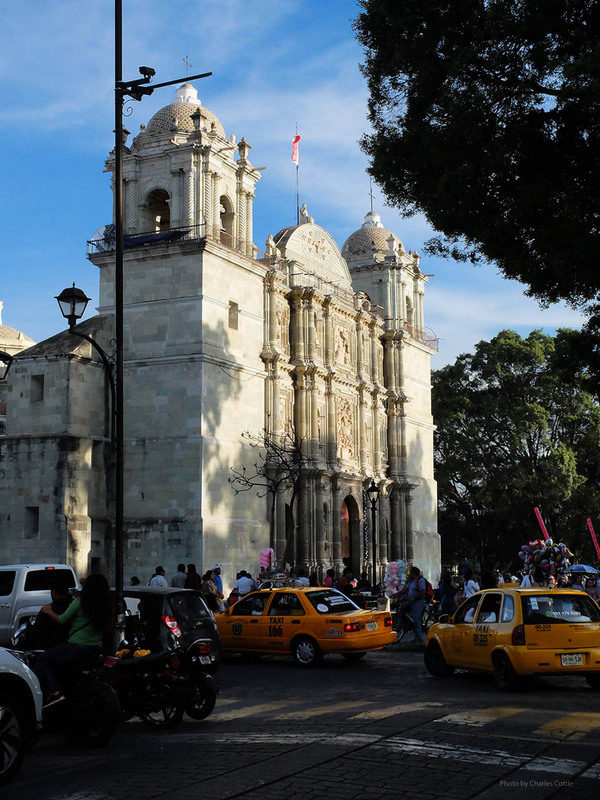 Like most visitors to this city in southern Mexico, I stay in the historic district, which like the historic districts of many former Spanish colonial cities, is home to beautiful churches, Spanish colonial architecture, and cobble-stone streets. 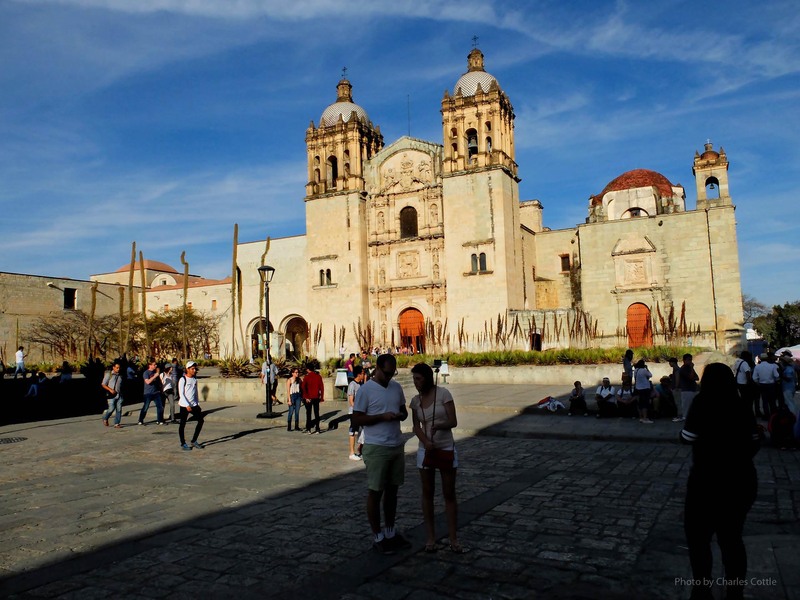 Yet, these features alone do not convey the experience one gets when walking the streets, relaxing in the parks, and simply passing the time in Oaxaca. On a recent trip to the city I decided to take a walk and take a few snapshots of those features of the city that, for me, helped define the experience of being there. It was a Friday evening and I had no firm ideas of what I might find in the way of interesting photos. 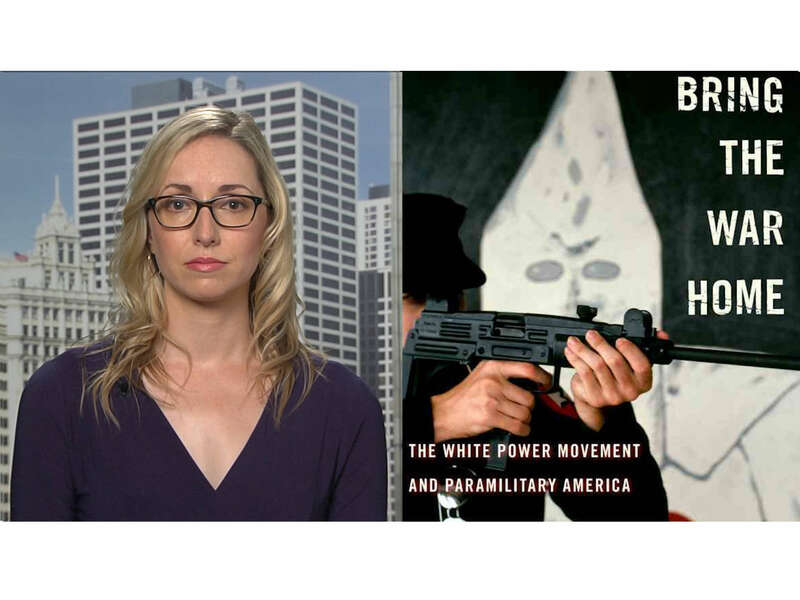 This photo essay is a report on that experiment. Readers may follow my route by linking to this map. 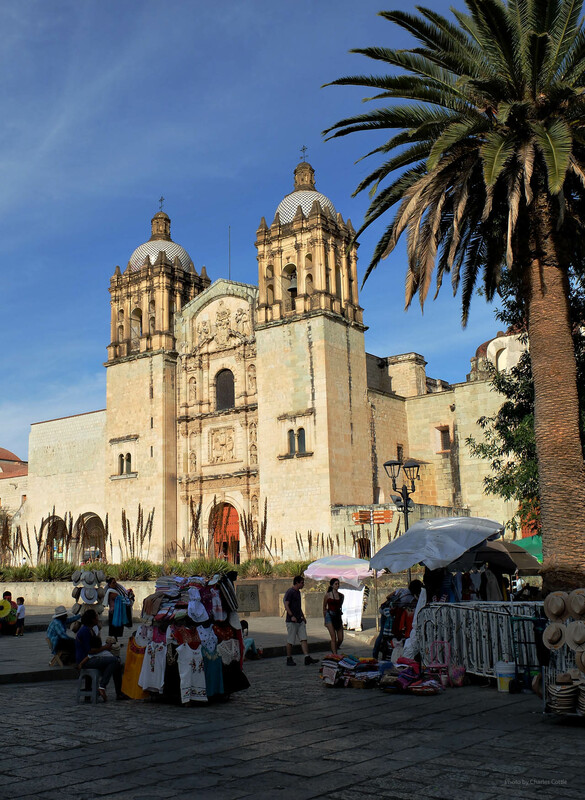 Because of this building and others like it, the city center of Oaxaca, along with spectacular archaeological ruins on the edge of the city, were designated a UNESCO World Heritage Site in 1987. Because Santo Domingo is such a draw for tourists, there are always vendors outside the church. Vendors are usually poor people who make a small amount off each item they sell. Oaxaca is famous for weaving and many vendors sell a variety of woven products such as rebozos, table cloths, blouses, and so forth. Indigenous women who come to the city to sell products have no choice but to bring their small children with them. It is not uncommon to see mothers carrying infants while selling trinkets in tourist areas. The social issues surrounding the poverty in Oaxaca constitute a discussion far too extensive for this short essay. In the photo on the left below a vendor is feeding children pozole, a popular dish in Oaxaca (and most of Mexico). Pozole is hominy, a dish that is also popular in the southern United States. In this case I am guessing that the dish is pozole with pork. In the photo on the right a vendor, surely someone’s grandmother, is crossing the street in search of buyers. From her dress, I surmise that she is from the Triqui (also Trique) indigenous group. In the state of Oaxaca there are sixteen officially recognized ethnic groups, each with their own language and traditions. 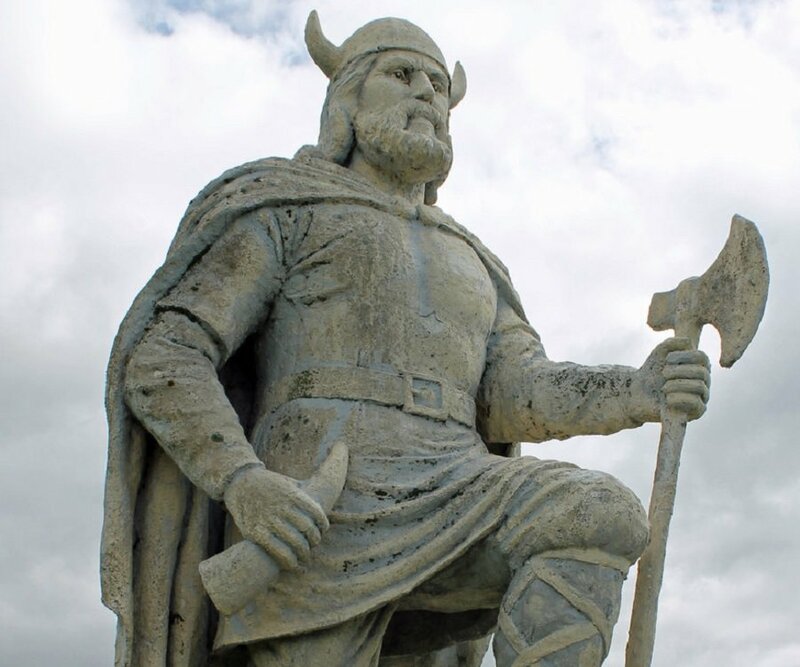 Thus, including Spanish, there are seventeen languages spoken throughout the state. 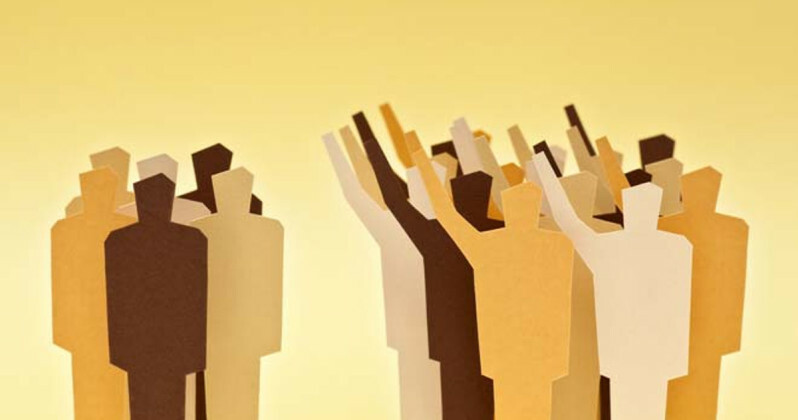 In reality, however, there are many more languages once we consider that numerous sub-groups of an indigenous group, who supposedly speak the same language, cannot communicate with each other. People watching is always an enjoyable activity in Oaxaca. Spotting the tourists around Santo Domingo is easy. They are always the ones who want a selfie with the church in the background. 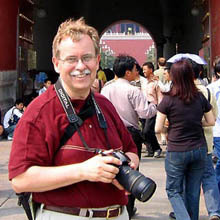 It is as if the church were built to serve as a background for tourist photos. 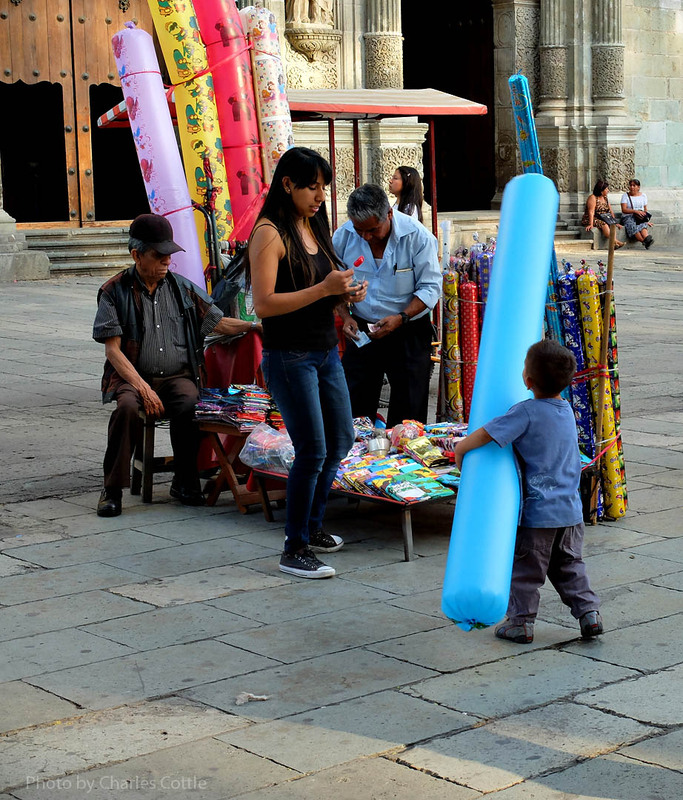 Selfie sticks are now the rage in Oaxaca. They seem to be everywhere. People attach their telephones to the end of the stick and somehow take their own photos. In the photo below a young woman is preparing to take a picture of herself and her companion with one of these devices. I continued my walk, leaving Santo Domingo and headed for Garcia Vigíl, a block away, via the cross-over known as the Plazuela de Carmen Alto. On the way I came upon a dramatic presentation by the young woman pictured below. She was performing a play for a group of children. I watched for several minutes, but was never able to figure out what the play was about. The children, however, were delighted and enthralled by the performance. 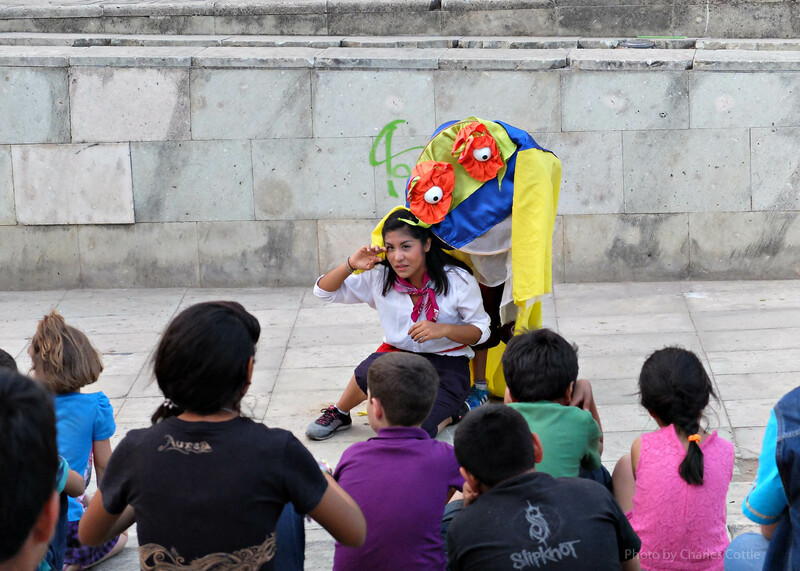 After watching the children’s play for a while, I walked down Garcia Vigíl toward the city square. In Spanish the word is “zócalo.” I like to go there because of the constant activity. At the Zócalo people sit and talk, play with their children, watch clowns, listen to musicians, or eat at one of the restaurants surrounding the square. I took the following photo at the corner of Garcia Vigíl and Independencia. The church is the Cathedral of Oaxaca. Because it is a cathedral, it is the seat of ecclesiastical power within the diocese. The interior of the cathedral is impressive, but not nearly so much as the church of Santo Domingo. While waiting to cross the street, I spotted the two young women on the motor bike shown in the photo below. I was pleasantly surprised by their appearance on the scene. 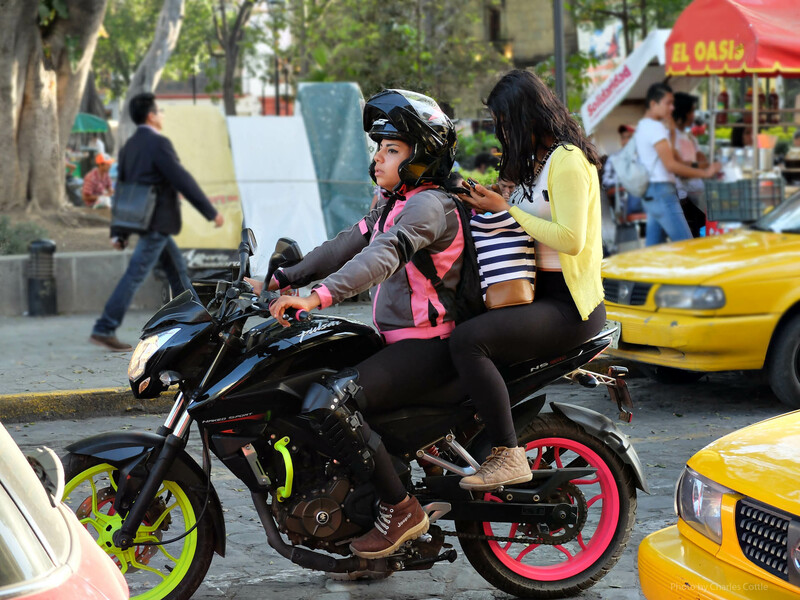 It was the first time I had seen young women on a motorbike in Oaxaca. The driver appears prepared for an accident, but her passenger seems oblivious to the world around her while she checks her cell phone. In front of the cathedral I spotted a mother who had just bought her son a long balloon. I have only seen this type of balloon in Oaxaca. Children love them. 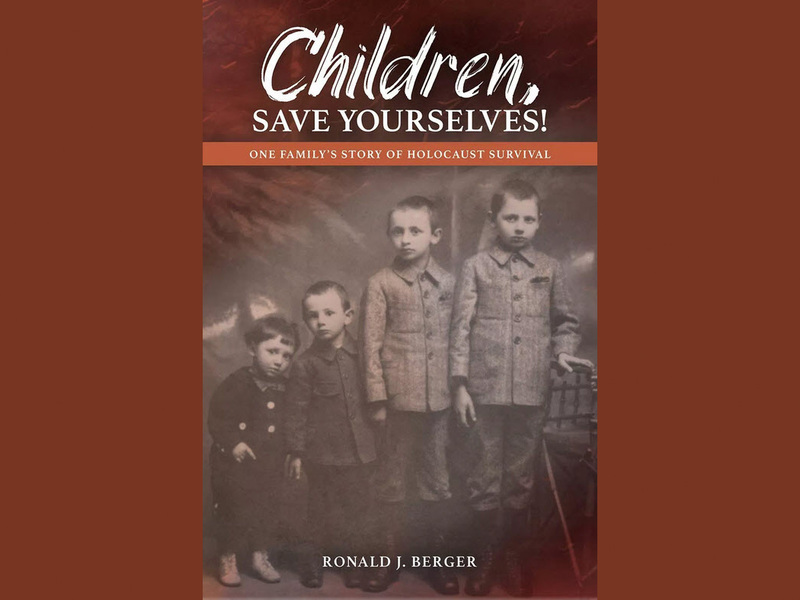 Usually, their parents or an older sibling will hit the balloon high into the air and the little ones will run after them, screaming with delight. Just beyond the cathedral begins the zócalo. 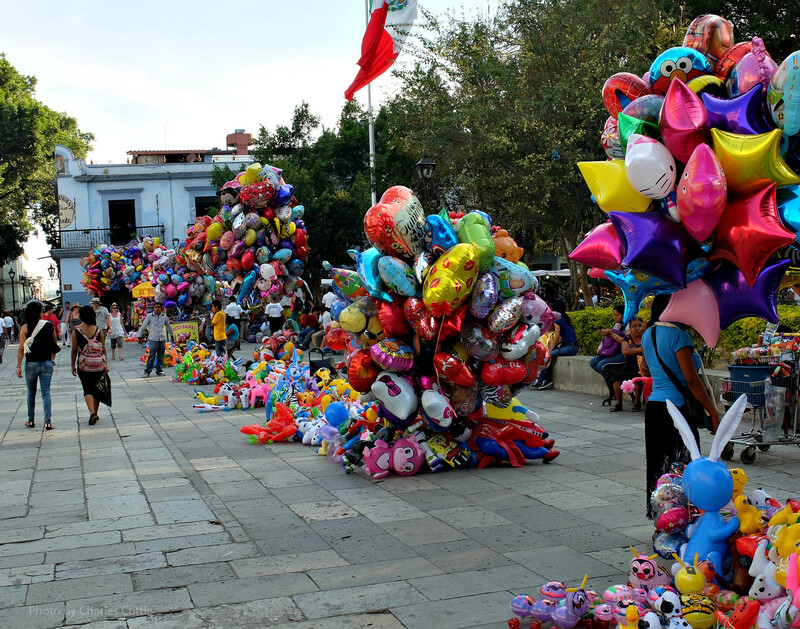 In the space in front of the cathedral, known as the “Alameda,” balloon and toy vendors stand ready to indulge any child’s fancy. The photo below is of the Zócalo. Here we see only a hint of the kinds of activities that go on here. In the background a band shell can be seen. On occasion, performances take place there. 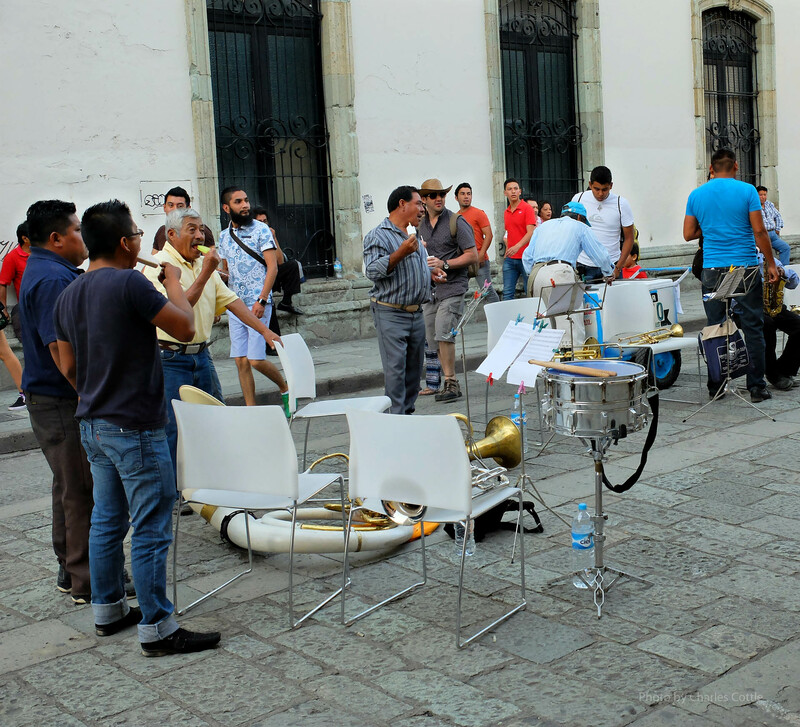 In the space in the foreground the Oaxaca city band plays concerts every Sunday at 12:30 in the afternoon. Along the sides of the square, to the left and right from this perspective, are restaurants. On the far side is the former governmental palace, now a museum. The tradition of the cathedral and the governmental palace, the seats of ecclesiastical and secular power, being on the city square is an old pattern that is replicated throughout Latin America. Oaxaca is no exception. 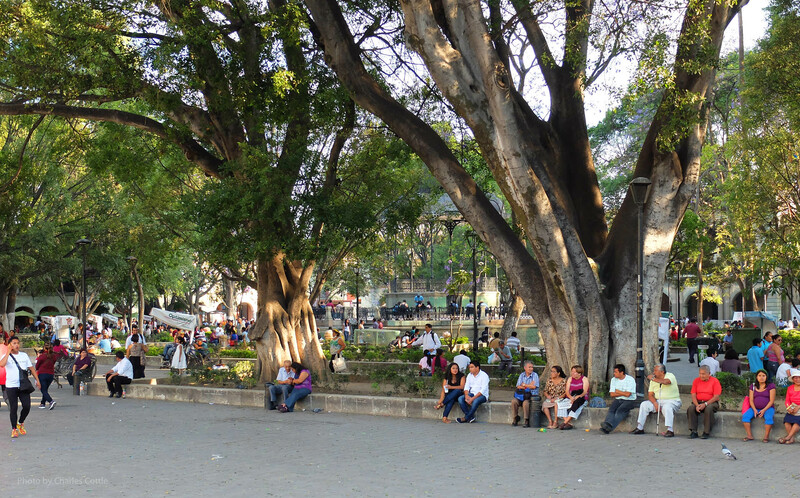 One can spend hours on the Zócalo just relaxing under the large trees and watching people. One will see families, friends, vendors, musicians, and tourists. The atmosphere is remarkable. For more on the Zócalo in Oaxaca, see my earlier piece on the use of public space. After staying at the Zócalo for a while, I decided to return to my hotel via the pedestrian mall known as the Andén Macedonio Alcalá. The mall runs north and south between Independencia on the south to above Santo Domingo on the north. Free of motorized vehicles, pedestrians walk between 16th and 17th century buildings. Among these are the university’s School of Law and Social Sciences, the public library, and the Museum of Contemporary Art. Vendors, of course, populate the mall along with pedestrians. 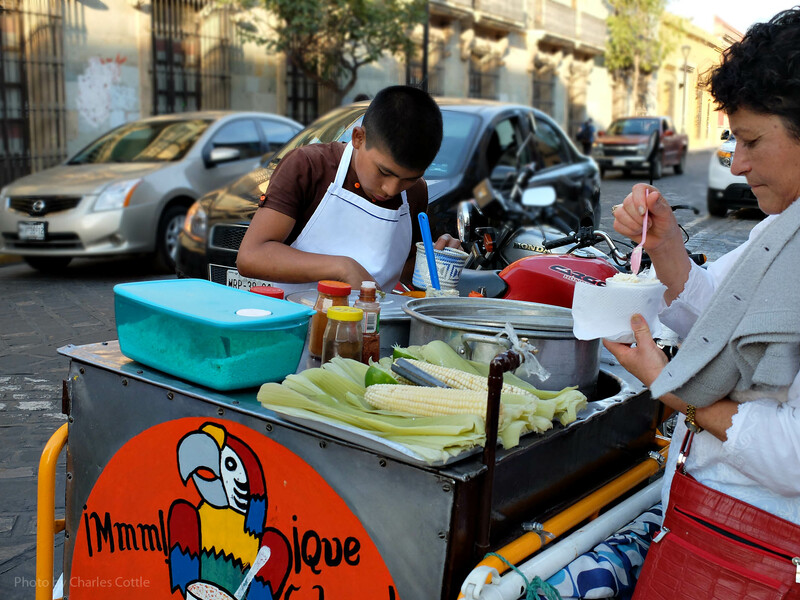 The following photo is is a young vendor serving his customer a dish of esquites, a steamed sweet corn concoction often served with lime, mayonnaise, and chile powder. A little further up the mall I encountered a band taking a break. I don’t know why the band was there, but I was getting hungry, so I decided not to wait to find out. I noticed, however, that almost every member of the band had decided to eat an ice cream bar. At this point it was getting late and I returned to my hotel. The following day was Saturday, and once again in the late afternoon, I went for a walk. I followed the same route. 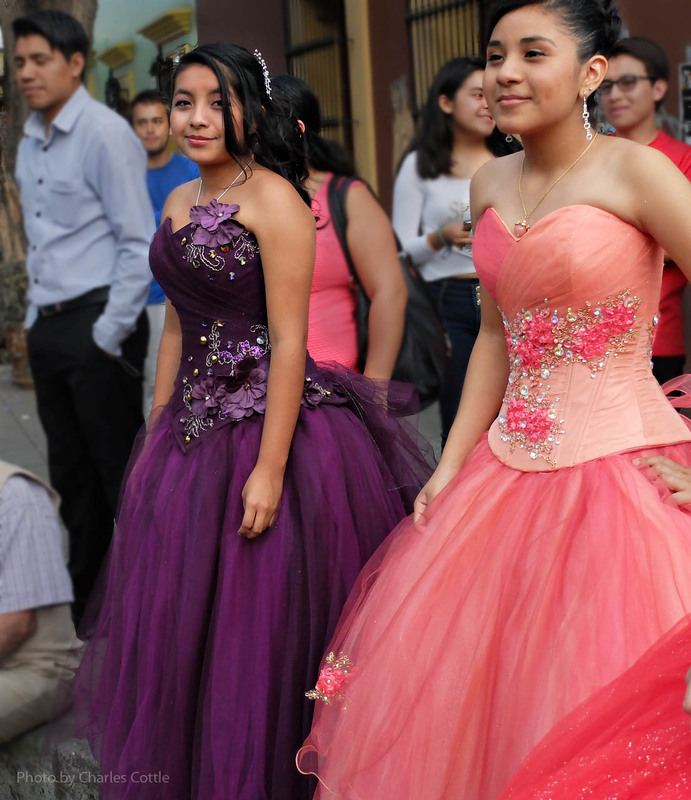 Along side Santo Domingo in a little area known as the Pañuelito, I happened upon a fashion show. On the small stage a group of event dignitaries stood, each making a small speech about this “important event.” I listened for a while as the organizers thanked everyone in Mexico except the President of the republic for helping put this show together. Meanwhile, the young and anxious participants waited patiently for the show to begin. The following photo features a couple of the participants. 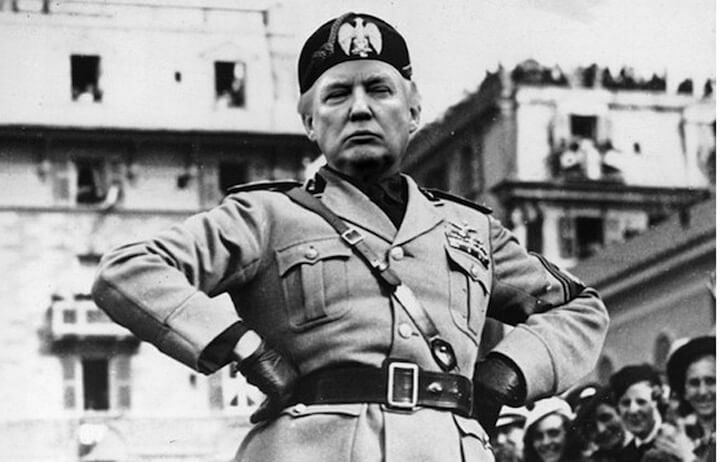 Due to the interminable speeches, I decided to move on. 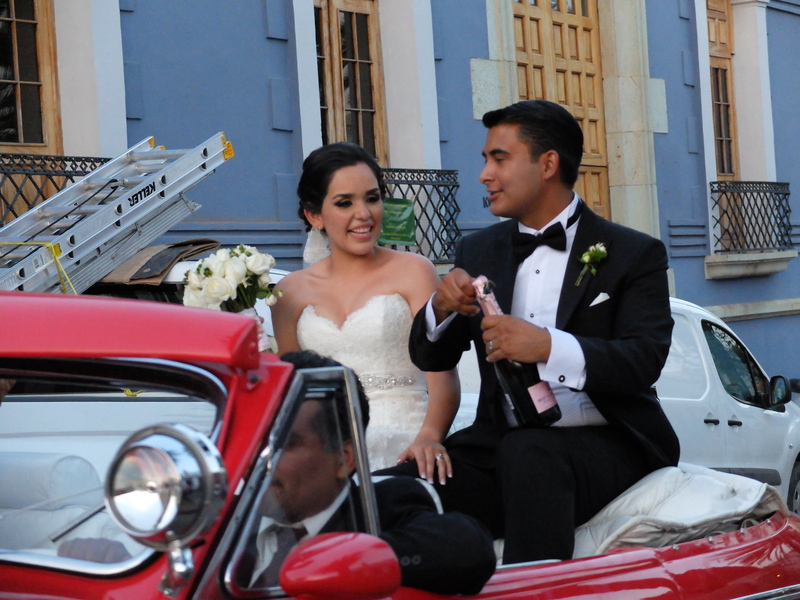 I did not get far before I encountered a wedding party leaving the Santo Domingo church. There were giant puppets (monos de calenda) representing the bride and groom and a band playing. The bride and groom and others were dancing in the street. After spending some time enjoying the music and the crowd at the wedding celebration, I headed back to Garcia Vigíl, the street one block away. Arriving there, I spotted a water truck pumping water into one of the restaurants. These trucks can often be seen, usually at night, next to restaurants in Oaxaca. They pump water for human consumption into holding tanks that the restaurants use for food preparation. In Oaxaca and throughout Mexico people do not drink water from the tap for health reasons. For that reason, selling potable water to restaurants is good business. I proceeded down Garcia Vigíl, but I didn’t get far. 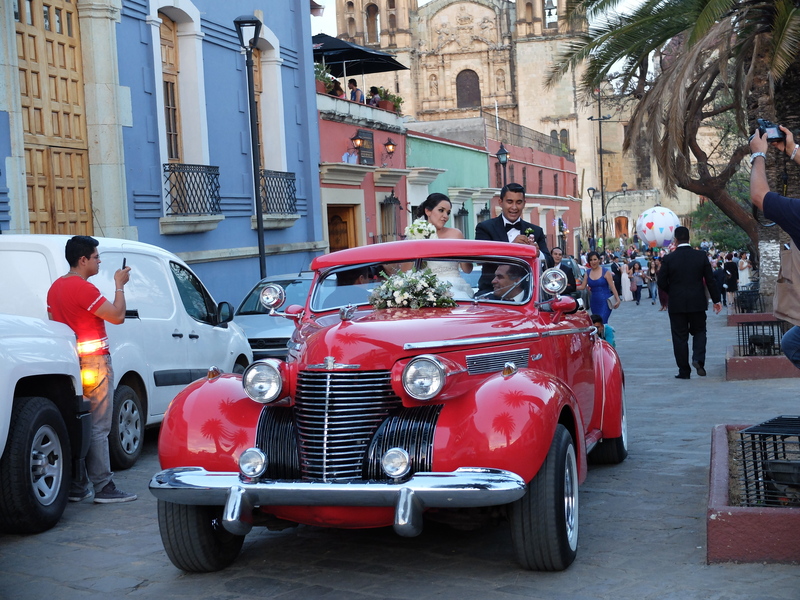 Arriving at Allende, the street leading directly back to Santo Domingo, I spotted the bride and groom leaving the scene in a bright red 1939 Cadillac convertible. As they passed, I noticed they were opening a bottle of champagne. At the departure of the bride and groom, I decided to direct the rest of my walk to finding a restaurant because the light was fading quickly, making it difficult to take photographs. 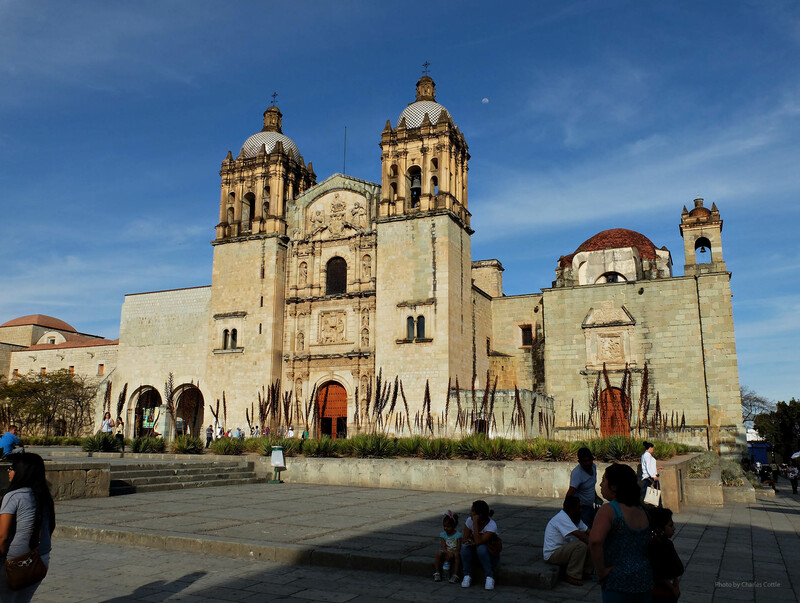 In this photo essay I have tried to provide a glimpse into the sights one might see in the historic district of Oaxaca. These are the kinds of sights a tourist will see. Outside the historic district one might see some of the same kinds of scenes, but the context would be different. In the everyday life of most citizens of Oaxaca, people go to work, educate their children, and raise their families – just like anywhere else. This post also appears in Wise Guys. How nice to enjoy Mexico with my morning coffee. I see why it keeps calling you to return. Lovely essay. Thank you Sarah. 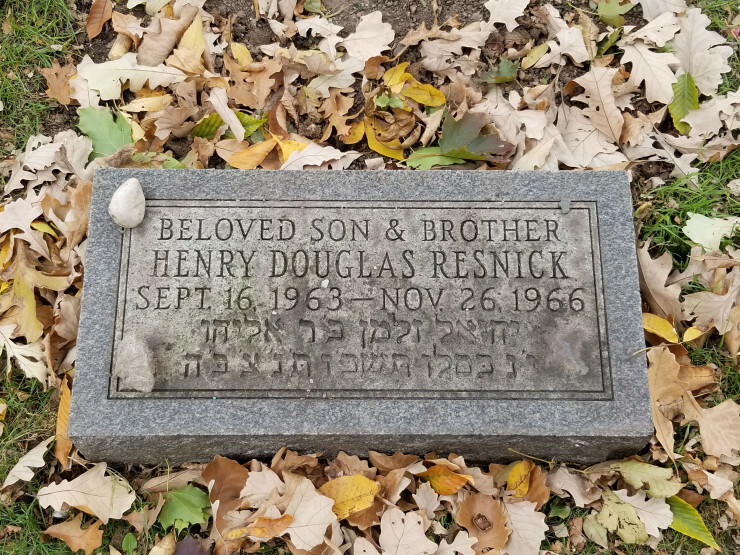 I hope you are doing well.